Concept is fastest, most powerful Golf ever made. VW has revealed the first pictures of its extreme Golf R 400 concept that will debut in Beijing this month. Using the same turbo-four as the Golf R, the 400 Concept has been boosted from 296 to 395 horsepower, enabling it to sprint from 0-62 mph in 3.9 seconds – over a second faster than the already-potent Golf R – and hit a top speed of 174 mph. 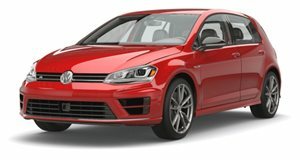 Power is sent to all four wheels via the same six-speed dual-clutch in the Golf R, and also borrows its suspension set up. The R 400 boasts styling inspired by the 1988 Rallye Golf G60 homologation special, with flared wheel arches housing 19-inch alloys, large dual exhaust pipes (a nod to the original R32) as well as new body and bumper elements including a front wing, two rear wings and motorsport-inspired rear diffuser. Special silver metallic paint with yellow stripes is echoed in the interior, which comes with sporty seats and plenty of carbon and Alcantara. Look out for non-sketched images of the R400 when the car debuts in the Far East. VW will doubtless be quizzed about the chances of putting this car into production. For now, the carmaker insists the R400 is purely a concept.